Welcome to the Ludwig Ombregt : A System of Orthopaedic Medicine website. 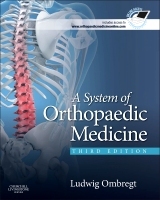 Building on the previous edition, A System of Orthopaedic Medicine now comes with access to online resources designed to support and enhance the learning experience of each and every clinician using the book. This new edition has been streamlined for easier access and handling by transferring all the applied anatomy chapters, references, links and other selected chapters onto the online resources.